Heat oven to 450°F. Remove pie crusts from pouches; unroll on work surface. With 4-inch round cutter, cut 7 rounds from each crust, shaping and rerolling as necessary. Firmly press each round in bottom and up side of each of 28 ungreased regular-size muffin cups. Prick with fork. Bake 8 to 9 minutes or until lightly browned. Cool completely, about 30 minutes. Meanwhile, in 1-quart saucepan, melt chocolate over low heat; cool. In small bowl, beat butter on medium speed of electric mixer until fluffy. Gradually beat in sugar until light and fluffy. Beat in cooled chocolate, malted milk powder and vanilla until well blended. Add eggs 1 at a time, beating on high speed 2 minutes after each addition; beat until mixture is smooth and fluffy. Spoon into cooled baked pie crusts. Refrigerate 2 hours before serving. Garnish with whipped cream and chopped malted milk balls. 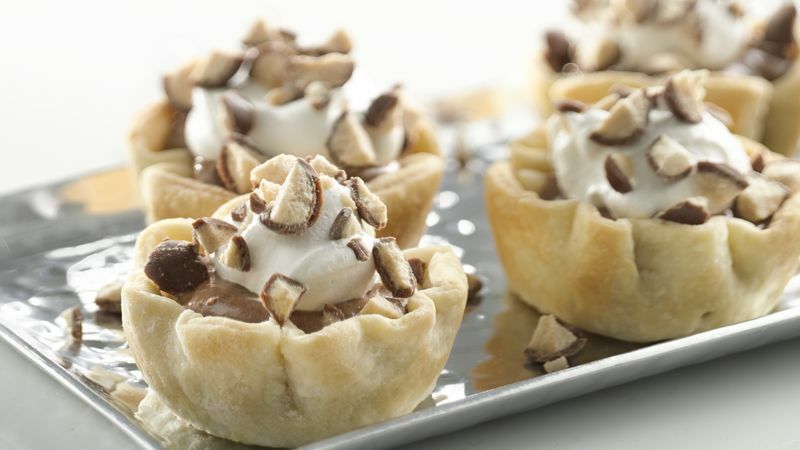 These mini pies can be made in advance for parties and gatherings. Make up to a day in advance, then store in refrigerator until ready to serve. Garnish with whipped cream just before serving.